Rancho del Paso (RDP) is a luxury development, and the owner's house, grounds and equestrian facilities have been built to premiere standards. RDP is where the owners live, and horses are boarded. The South gate at Rancho del Paso opens to a small, elite subdivision of 6 building lots, named Hacienda Alta, an amazingly beautiful and peaceful place to build your dream home. The sweeping vistas are un-paralleled in any other lots available Lakeside. Breezes coming up from the lake to the ridge that RDP stands on are cool and refreshing, and keep the amount of flying insects to a minimum. The pastoral setting -- less than 10 minutes from the Chapala malecon, stores, tennis and golf -- ensures your peace and quiet. 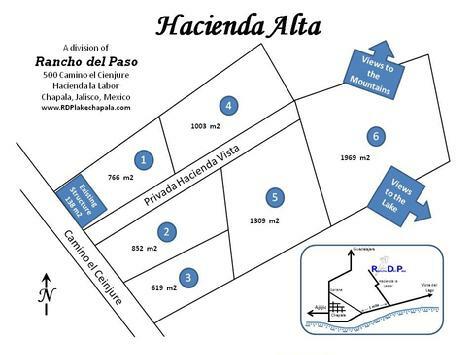 The 6 lot subdivision has clear and un-encumbered titles for each lot individually -- Hacienda Alta's "Vista" lots 1 - 6 (the lowest numbers are closest to the street). A number of pre-built amenities are included in the price of each lot -- clearing the ground, and grading the lots, exterior wall and fences surrounding the development with electrified and alarmed security system on the road frontage, gated entrance with an interior access road, provision for individual electrical meters and SIMAPA water supply, and underground conduits to run your utility lines. 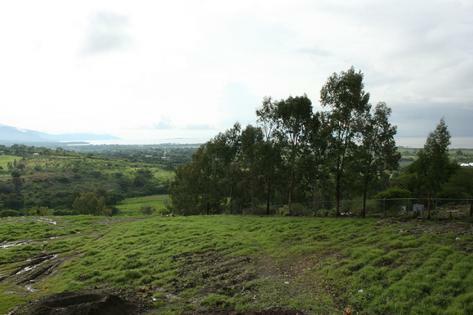 The purchase price includes a private access road with "empedrado" paving and underground utility conduits for Lots 1, 2, 4, 5 and 6. Lot 3 has a lower price per square meter because that lot does not have access to the privada; the buyer will have to build their own entrance gate through the front wall. Building costs can average $30 - $50 USD per square foot for standard construction, and $50 - $75 per square foot for luxury construction, including all appliances, tiles, painting, cabinets, fixtures and landscaping. Hacienda Alta’s owners live just north of the subdivision, at Rancho del Paso. Their home showcases the luxurious design and construction available to RDP home builders. Typical of what you could build for your home here, it is 2 stories high and 5,460 square feet in size, including the outdoor covered terraces, 4 bedrooms, 3 1/2 baths, and 2 car garage with automated doors. Laundry room, fireplaces, office, storage galore, wrap-around covered terraces and views ! views! views! Full of luxury components such as hand carved cantera stone details, wrought iron, etched glass, chandeliers, and Mexican tiles as well as top of the line appliances and fixtures.